Phuket is perhaps best known as a beach destination, which is hardly surprising when the island is practically ringed with stunning stretches of sand. However, Thailand’s largest island can be different things for different people, including a place to enjoy a romantic getaway with your significant other. Phuket romantic restaurants are just the tip of the iceberg as there are plenty of memorable experiences you can share with your special someone. The first of our Phuket romantic tips is to check out the stunning Phang Nga Bay. The striking limestone islands rising out of the emerald waters make for an almost otherworldly environment. With the special kayaking cruises, you can get extra-close to this rugged setting, slipping through secret caves to explore the inside of room-like natural structures. You can then enjoy a gentle cruise home after all of that shared adventure, watching the last rays of the sun glitter across the Andaman Sea. There are a number of points around Phuket which offer really amazing views – so amazing, in fact, that one or two are frequently used by wedding photographers as a breathtaking backdrop. The best of these is Promthep Cape, right in the south of the island. While the eateries around the cape are not among the best Phuket romantic restaurants, they can offer somewhere to enjoy a drink with your loved one as the sun sets. We’ve had too much dependence on sunsets for the first of our Phuket romantic tips, so let’s try a daytime activity next – snorkelling. The seas around Phuket are crisp, clear and full of vibrant, colourful life. While going on a diving trip is certainly the best way to enjoy the outstanding sights, it requires a lot of training and equipment. However, if you just grab a snorkel, mask and some fins, you can be checking out beautiful corals with your loved one within a few metres of the shore. Particularly good spots include Nakalay Bay, Laem Ka Beach and Ao Sane Beach. There is a reason why fine dining has become almost a clichéd first date idea – because it is one of the most romantic experiences you can have. In itself, enjoying a first-class meal is a wonderful experience to share. Add candle- and moonlight will crank the romance up a few levels, but having your toes in the sand while you’re serenaded by the swishing of nearby waves is the ultimate romantic experience. 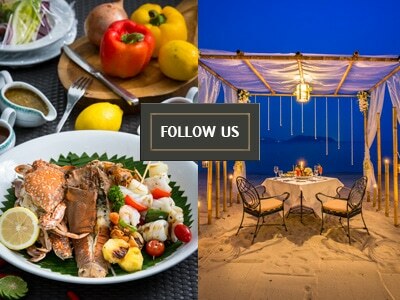 Nakalay Beachfront Dining by Thavorn Beach Village Resort provides exactly that experience, with the added bonus of some of the finest Royal Thai cuisine available in Phuket.